Most of us dream about having the time to make fresh bread, to fill our kitchen with the irrestible aromas of a bakery every day. Now, with Jeff and Zoe's new bread-making method, you too can make your own loaves in only five minutes a day! No bread machine required, and no need for kneading - it's revolutionary! In this amazing new book, Jeff and Zoe prove that baking bread can be easier and quicker than a trip to the baker's. Their method is quick and simple, and produces perfect, scrumptious loaves every time. In exchange for a mere five minutes of your time, your warm, indulgent, crusty breads will rival those of the finest bakers in the world. 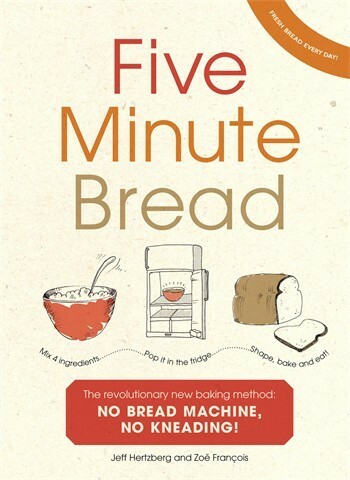 With nearly 100 recipes that use this ingenious technique, Five Minute Bread is a revelation for anyone who thinks that home-made bread is too much work. Crusty baguettes, mouth-watering ciabattas, hearty sandwich loaves and even buttery pastries will become everyday treats with this innovative book.